Seoul prosecutors said Sunday that they have informed the United States Forces Korea (USFK) of a U.S. Army soldier suspected of uploading a fake picture of North Korea's shelling on a southern island on the Internet. According to the prosecution, the Korean-American private, identified only by his initial M, allegedly posted a satellite photo of the U.S.'s 2003 attack on Baghdad, Iraq, on an Internet bulletin board, contending that it depicted North Korea's deadly artillery attack against South Korea's border island of Yeonpyeong on Nov. 23. The picture was taken on April 2, 2003 and posted on the Web site of the U.S. National Aeronautics and Space Administration (NASA), investigators said. The 20-year-old suspect, a soldier in the U.S. Army, downloaded the picture while surfing online and reposted it on the bulletin board, saying that he obtained high-quality information from the U.S. Army, they added. 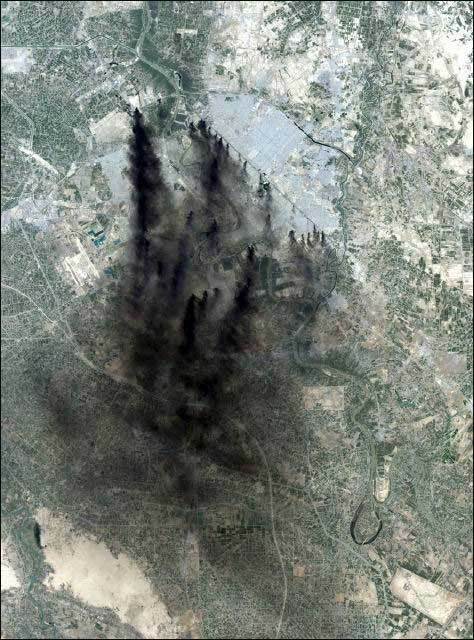 The photo, which showed a devastated area engulfed in black smoke, spread rapidly online, and local and international broadcasters including CNN cited the picture in reports. "The suspect passed off the Baghdad picture as a photo of the bombardment on Yeonpyeong Island and made people believe that the situation was more serious," said an official from the Seoul Central District Prosecutors' Office. "We informed the USFK of this illegality in order to declare our firm pledge to punish any illegal acts," said the official. About 28,500 U.S. troops are stationed in South Korea, a legacy of the Korean War that ended with a cease-fire, leaving the Korean Peninsula technically still at war. (서울=연합뉴스) 강건택 기자 = 서울중앙지검 첨단범죄수사2부(김영대 부장검사 )는 이라크 폭격 장면을 담은 사진을 북한의 연평도 포격 현장이라고 속여 인터넷에 게시한 미 육군 사병의 신원을 확인해 미군 측에 통보했다고 19일 밝혔다. 검찰에 따르면 한국계 미군 이병 M(20)씨는 지난달 23일 오후 3시30분께 한 커 뮤니티사이트 게시판에 `서버에 위성사진 떴다'는 제목으로 이라크 바그다드 폭격 당시의 위성사진을 북한의 연평도 포격 사진인 것처럼 올린 혐의를 받고 있다. 이 사진은 미항공우주국(NASA) 홈페이지에 게재된 2003년 4월2일 바그다드 폭격 사진으로, M씨가 인터넷 검색을 통해 내려받은 것으로 조사됐다. 그러나 해당 지역이 온통 검은 연기로 휩싸인 광경을 담고 있어 수많은 네티즌 이 진짜 연평도 포격 장면으로 착각하고 다른 포털사이트나 트위터 등으로 사진을 퍼날랐다. 심지어 CNN을 비롯한 국내외 방송사들이 연평도 포격 속보를 전하면서 이 사진 을 인용하기도 했다. M씨는 국내에서 고교를 졸업하고서 지난해 미국으로 건너가 워싱턴주 소재 육군 부대에서 보급병으로 근무 중이며 평소 국내 인터넷 사이트에 자주 접속했다고 검찰 은 전했다. M씨는 자주 이용하던 사이트 게시판에 연평도 포격에 관한 글이 많이 올라오자 미군에서 고급 정보를 입수한 것처럼 과시하려고 엉터리 사진을 올린 것으로 검찰은 보고 있다. 검찰 관계자는 "M씨는 폭격으로 극심한 피해를 입은 바그다드 사진을 연평도 사 진으로 위장해 인터넷과 방송으로 사진을 접한 시민들이 현장 상황을 실제보다 심각 한 것으로 오인하게 만들었다"고 설명했다. 이어 "위법 행위는 국내외를 불문하고 끝까지 책임을 묻겠다는 척결 의지를 보 여주고자 M씨의 위법 사실을 미군에 통보했다"고 덧붙였다. 검찰은 연평도 포격 직후 휴대전화 문자메시지로 가짜 징집령 등의 유언비어를 퍼뜨린 혐의(전기통신기본법 위반)로 지금까지 모두 28명을 불구속 기소했고, 죄질 이 가볍거나 나이가 어린 19명은 보호관찰소 사이버범죄 교화프로그램을 이수하는 조건으로 입건 유예키로 했다.